I have good days and bad days. Sometimes I manage to get through a few days with no tears. Some days I wonder how I will ever get through this? Am I strong enough? I ask myself am I selfish for feeling the way I do or for sheltering myself away from my friends with children? Will I regret this? I am only trying to save myself from pain. It is a way of self preservation like that video said I posted about awhile ago. I just got invited to two baby showers last week which I will have to regretfully decline the invite. No one wants the lady who cries in the bathroom at their shower. I could probably hold myself together but really all those onesies and baby talk will feel like another twist of the dagger. Infertility has changed who I am. For one thing I never used to cry. Now I am happy if I week goes by with no tears. It has made me stronger and weaker at the same time. It has made me put myself first and to stop caring what other people think about certain things. We had a wedding last weekend. I have never felt so left out. There were about 5 babies there that were under the age of a year. Topic of choice was pregnancy and everything baby related. You can imagine me the infertile sitting at the end of the table pretending to do something on my phone while the ladies all conversed about their pregnancies. No one looking my way because why would they? I don’t fit in. I feel singled out. Even my mother in law said something like “Isn’t their baby so cute?” and then apologized and said she needs to stop saying that stuff in front of me. I am happy she understands but then on the other hand I am sad as it reminds me of what I don’t have and that we are different. I started Provera Sunday and am only on 5 days of it. So good old AF should be showing soon. Tomorrow is my birthday and I would consider it a birthday gift if AF arrived because I know that transfer is that much closer! We also got the letter approving the FET from insurance so another plus. I wrote the first part of this post a few days ago. I am actually feeling better today. Things should be looking up. This one will work…..it just has to! Or else I may go off my rocker! We have another Wedding this weekend but this time we are not staying over. I may have over-served myself last weekend on both Friday and Saturday night. I am still getting over my hangover! This is why I don’t drink anymore. Hangovers from hell. Since we were away the whole weekend I missed out on my early morning gym trips. I did go early last Friday because I had it off. There was a beautiful sunrise. 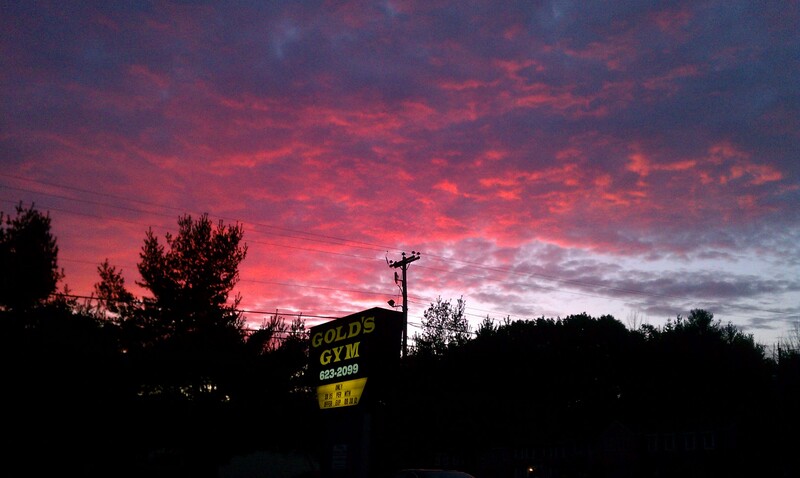 How can you not feel good going into the gym when you see this…. I should be able to make it this for an early morning session this weekend or at least on Saturday. I may even try to get the hubby up to go with me. I have cut back on cardio this week and may continue to do so. I don’t want anything to ruin my chances for a BFP this cycle! I have pulled myself away from blogging the past few weeks. Hell I have pulled myself away from everything and everyone I know. I don’t even want to be around myself some days. I am frustrated, sad and just ready for this journey to have a happy ending. I think the “inbetweens” are some of the hardest times. By “inbetweens” I mean inbetween IVFs and inbetween test results. Is this a word? Probably not but that’s OK I am allowed to use it. I find not preparing or planning for something is the hardest for me. I find myself feeling a lot more depressed about IF then at other times. 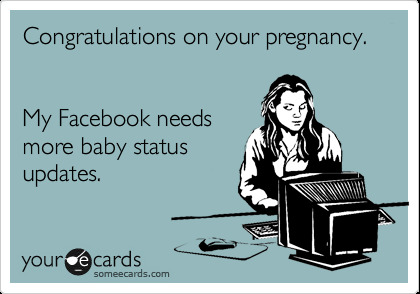 I also find myself affected more by all the little things like the pregnant woman heating her food up next to me at work, the pregnancy tests on the end of the shampoo aisle or the fact that every time I log onto facebook it’s another pregnancy or birth announcement. The past few times we have jumped into birth control to get ready for another cycle right after a failed one. This time because of the testing I chose not to take them. When I am not actively doing something I feel anxious and find myself thinking more about our failures. Even if I am just on Birth control pills it feels like I am doing something. Now there’s just a dull lull. Waiting…waiting…..
Well the good news is I finally got some results back. Both me and my husband’s karyotype test came back normal. The biopsy…normal. Now the question is then why does it keep on failing??? Also since this month was my first month taking nothing in six months guess what happens? nothing. No ovulation and I am on day 30. I have called the clinic and they will be putting me on pills to start my period and then we will be going into our FET cycle. Enough of the depressing stuff. Good News is that I have a short week this week! It has been a rough couple of weeks at work. Very busy but we had Monday off for the holiday and I took off Friday. Yay Me!